Interview with BT and EU Science Competition Winners! We caught up with Sophie Healy Thow, Emer Hicky and Ciara Judge who won the Science & Technology section of the BT and EU Young Scientist Competitions – quite an achievement! We talked about what the young people themselves thought about technology in the classroom and the background of their award-winning Science project! Jack and Aisling interviewed Lord Puttnam. In the interview, they talked about technology in education, UNICEF, David’s worldwide teaching from his old barn in Cork and they couldn’t help but mention his huge success in film making. Lord Puttnam sits on the Labour benches but he’s not a politician. He believes that technology is the only way forward. Jack and Finn spoke to Joe Dale about Digital Storytelling, how he integrates technology into the Modern Foreign Languauge classroom and his thoughts on the ‘Spark the Imagination’ conference. Dave, Finn and Jack interviewed Paudie Scanlon about the why he came to CESI and what he wanted to take away from it. 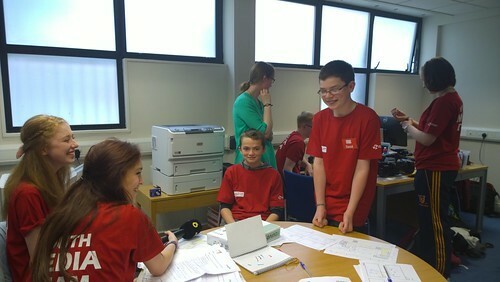 Finn and Jack spoke to Adrienne Webb, chairperson of CESI to hear about their “Spark the Imagination” conference. She speaks about her long term involvement with CESI and the work that they do to support teachers to integrate technology in their classrooms.